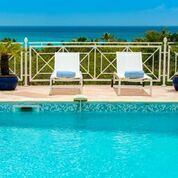 Highlights: Villa Hope Estate, Orient Bay, St Martin, luxurious 4BR vacation rental in Hope Hill Estates, perfect for couples or families, fabulous views, great privacy, lush gardens, gourmet kitchen, quality throughout! Rent as 2, 3 or 4 BR. Call 800 480 8555 for more info. The living, dining, and huge kitchen flow seamlessly into one another making this a fabulous entertainment space. The living room offers a spacious social area for family or friends with plenty of comfortable seating in a modern leather sofa sectional that faces a large flat screen HDTV. The dining table seats 6 - 8 persons plus there is alfresco dining under the terrace just through the sliding glass doors of the floor to ceiling glass walls that run the the entire length of the living and dining room space. The very impressive gourmet kitchen is every cooks dream. It features granite counters, stainless steel appliances (commercial gas stove top, 2 ovens, built in microwave and espresso maker!). It also has all the necessary small appliances to indulge every whim, including those oh so delicious blended cocktails... and a fine set of dishes, utensils, etc. The villa offers 4 equal master suites, all with king beds and en-suite bathrooms, two of which have indoor and outdoor showers. They are each beautifully decorated with their own color schemes and are all accessed either from the living area, or through private exterior access. Each master suite includes a flat screen TV. All master suites have an en-suite bath and two include tub and shower while two offer just showers. Maid service is included every other day per week (except Sundays & Holidays). Two of the en-suite bathrooms offer an interior shower and a private exterior shower allowing you to experience the warm island air while showering. The covered terrace has comfortable outdoor furnishings and a BBQ grill. The beautiful dark tiled, infinity edge pool is surrounded by those fabulous gardens and is large enough for laps. 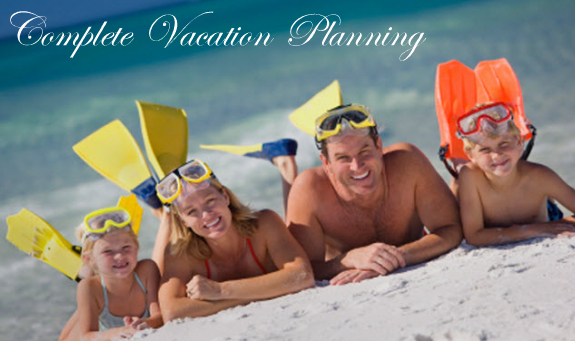 If you are a fun seeking individual then you've come to the right area of the island. 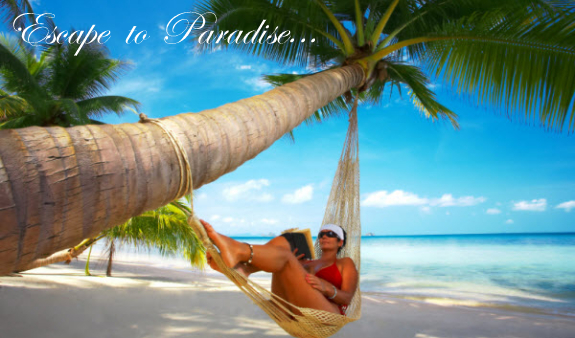 Over the years Orient Beach has been voted "one of the best Caribbean beaches" by many travelers magazines. It is 1.3 miles of soft white sand and is lined with beach bars/restaurants, and several water sports facilities offering anything one could possibly want to do in or on the water. The ocean is typically calm and warm year round. For those wanting a more relaxed beach experience, Anse Marcel is only 10 minutes away and is a pristine, tranquil beach. 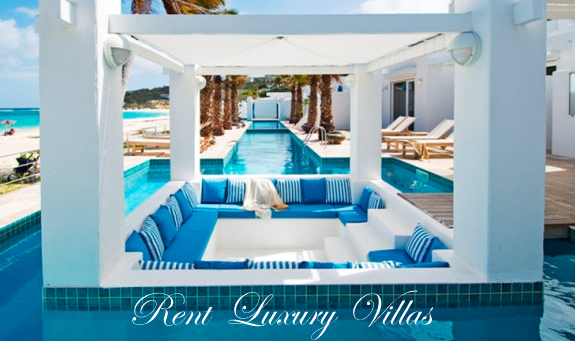 Most who rent this villa will want to spend the days relaxing around the pool. We can arrange for a private chef service for two or three meals daily. The quality of this service compares with the best on island restaurants at a very competitive cost. For those who enjoy St Martin's number one sport there are 18 + restaurants in Orient Bay and the "foodie capital or the Caribbean", Grand Case is just a 10 minute drive away. This quaint fishing village is lined with 45 of the best restaurants and galleries on the island. The capital city of Marigot is just 20 minutes away and in addition to more dining in the Marina Royale area, there is great shopping at Le West Indies Mall and the many small European boutiques and jewelery stores. Catch the ferry from the harbor for a day trip to Anguilla of St Bart. Please note that Hope Estate's "twin sister" Hope Belleview Villa, is located on an adjacent lot and offers the exact same floor plan and ammenities making this a wonderful option for groups needing up to 8 bedrooms. Whether enjoying Monte Verde or Bellvue, we are confident that you will have the vacation of a life time at either villa! This property is comparable to many of the finest luxury villas in the French Lowlands. Villa offers both 110 & 220 volts. Please call for current availability of Villa Monte Verde. This property is available year round for any date it is open. If this unit is not available we may have comparable properties that are available for your dates. Call 800 480 8555 for up-to-date availability. Minimum Stay7 nights in high season, 5 nights in low season and 2 weeks at Christmas. Additional tax and service charges include, maid service 3 times per week (except Sunday & Holidays), rental car reservations, 24/7 local assistance while on island, welcome gift, arrangements for chef service, restaurant reservations in high season, island concierge services before and during your stay.